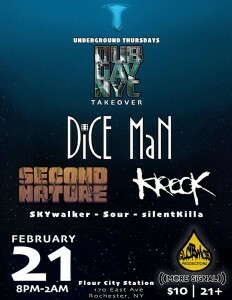 The Dubday-NYC Crew is coming up to Rochester with DiCE MaN, Second Nature, and Krook for a DEEP night of bass music at a new venue for Underground Thursdays! “DiCE MaN” is the musical persona of Wade Appleton. His style draws from all corners of the musical spectrum – incorporating heavy hitting basslines, live hip-hop routines, discombobulated breaks, folk-punk, and melodic undertones into a body-shaking, soul-shattering freak party. His background in theatre performance influences his approach to his sets, making every roll of the DiCE a unique, vibrant, emotive experience that keeps you dancing, thinking, and feeling some type of way.